Product prices and availability are accurate as of 2019-04-25 11:17:57 UTC and are subject to change. Any price and availability information displayed on http://www.amazon.com/ at the time of purchase will apply to the purchase of this product. 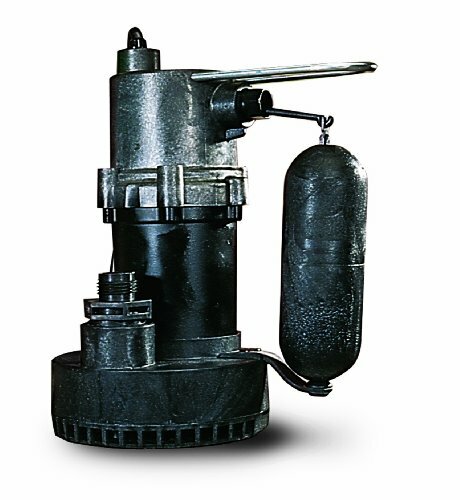 5.5-ASP automatic sump pump is for residential and light commercial use. 1-1/4" FNPT outlet with a garden hose adapter. 25' shutoff and corrosion-resistant zinc alloy housing. Integral snap-action float switch. Automatic operation has 7"-10" "ON" level range and 2"-5" "OFF" level range. Thermally protected. 3/8" solid handling capacity. Corrosion resistant polycarbonate switch housing/cover. Double seal on switch lever arm. Dynamically designed float to assure proper switch operation. Nylon impeller with no-clog design. Glass-filled polypropylene volute and base. Oil-filled motor housing. Screened inlet. CSA listed.